Halifax coach Richard Marshall has offered a candid assessment of his side’s chances of making the Super 8s Qualifiers for a second successive season, saying they are not currently ‘playing well enough’ to finish in the top four. Fax, who host Oldham at the Shay on Friday night (8.0), slipped to sixth in the Championship after losing 32-16 at Batley last weekend, although they remain just two points shy of third-placed Bradford. But while Fax are far from being out of the running with 10 league games still remaining, Marshall remains realistic. “At the moment, we’re not playing well enough to finish in the top four, it’s that simple,” said Marshall, whose side won 10 games straight during June, July and August last year to clinch fourth spot. “Consistency is key and that’s something we’ve not had this year. “We’ve no margin for error now and the competition’s changed; while I still believe we’re capable of going on a run like we did last year, it’s going to be a lot more difficult. “The players want it, but you would have to say Batley wanted it a little bit more than we did last weekend and that’s what got them the result. 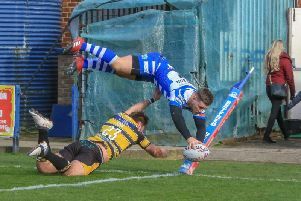 Oldham were humbled by Marshall’s side on Good Friday, with a first half blitz at Stalybridge giving Fax an unassailable half time lead. Since then though, Scott Naylor’s side have taken some significant scalps, including an incredible Challenge Cup win at Super League strugglers Hull KR. “Oldham are a good side and they’ll be coming to take another scalp,” said Marshall. “Look at who they’ve beaten; Hull KR, Batley, Sheffield, Featherstone. Fax should be bolstered by a potential ahead-of-schedule return for Australian front rower Mitch Cahalane, who injured his neck against Workington three weeks ago and had been expected to be sidelined until the end of the month. “Hopefully, Mitch will be back providing he comes through training okay this week,” said Marshall. “We struggled physically with the sheer size of some of Batley’s forwards and Mitch would give us a bit more in that area.